The Japanese invaded Kelantan on 8th December and were in full occupation by the 22nd of December 1941. They transferred Kelantan to Thai control in 1943. The state was freed from Japanese occupation on 8th September 1945 and became a state of the Federation of Malaya on 1st February 1948. It joined the other states of the peninsular to form the Federation of Malaya on 31st August 1957 and became a state of Malaysia on 16th September 1963. Sultan Ismail Petra was constitutionally deposed by the State Succession Council in favour of his eldest son in September 2010, after failing to recover from a severe and delibitating stroke in the previous May. This followed several months of challenges to the constitutional arrangements made in its wake by several disgruntled members of the Royal Family. The ruling prince: Ke Bawah Duli Yang Maha Mulia al-Sultan dan Yang di-Pertuan Bagi Negara Kelantan Dar ul-Naim, i.e. Sultan and Head of the State of Kelantan, with the style of His Royal Highness. The Royal consort of the ruling prince: Duli Yang Maha Mulia Raja Perempuan Negara Kelantan Dar ul-Naim, i.e. the Raja Perempuan of Kelantan, with the style of Her Royal Highness. Previously styled Sultana and Raja Permaisuri. The Heir Apparent: Duli Yang Teramat Mulia Tengku Mahkota Negara Kelantan Dar ul-Naim, i.e. the Crown Prince of Kelantan, with the style of His Highness. The Royal consort of the Heir Apparent: Duli Yang Teramat Mulia Tengku Ampuan Mahkota Negara Kelantan Dar ul-Naim, i.e. the Crown Princess of Kelantan, with the style of Her Highness. 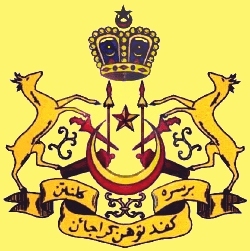 The non-Royal consort of the Heir Apparent: Duli Yang Teramat Mulia Tengku Puan Mahkota Negara Kelantan Dar ul-Naim, i.e. the Crown Princess of Kelantan, with the style of Her Highness. The Heir Presumptive: Yang Amat Mulia Tengku Bendahara Negara Kelantan Dar ul-Naim, with the style of His Highness. The Regent: Duli Yang Teramat Mulia Pemangku Raja Negara Kelantan Dar ul-Naim, i.e. the Prince Regent of Kelantan, with the style of His Highness. Abdullah b. Muhammad (Nakula). Keturunan Raja-Raja Kelantan dan Peristiwa-peristiwa Bersejarah, Perbadanan Muzium Negeri Kelantan, Kota bharu, 1981. Prof. P.E. de Josselin de Jong. Who's Who in the Malay Annals, Journal of the Malayan Branch of the Royal Asiatic Society, Volume XXXIV, Part 2, 1961. Anker Rentse, Salsilah Raja-raja Kelantan. Journal of the Malayan Branch of the Royal Asiatic Society, Volume XIV, Part 3, 1936. Ensiklopedia Sejarah dan Kebudayaan Melayu, Dewan Bahasa dan Pustaka Kementerian Pendidikan Malaysia, Kuala Lumpur, 1995. Oleh Mohd. Zain Saleh. Keluarga Diraja Kelantan Darulnaim, Istana Negeri, Kubang Kerian, 1987. Rahmat bin Sharipan. Perembangang Politik Melayu Tradisional Kelantan 1776-1842, Dewan Bahasa dan Pustaka Kementerian Pelajaran Malaysia, Kuala Lumpur, 1979. William R Roff (ed). Kelantan: Religion, Society and Politics in a Malay State. Oxford University Press, Kuala Lumpur, 1974. Sejarah Trengganu oleh Misbaha. Mansor Priting Press, Trengganu, 1968. Cyril Skinner and Justin Corfield. Rama III and the Siamese Expedition to Kedah in 1839, The Dispatches of Luang Udomsombat. Monash Papers on Southeast Asia - No. 30. Centre for South East Asian Studies, Monash University, Clayton, 1993. Sa'ad Shukri bin Haji Muda, Abdullah Al-Qari bin Haji Salleh & Drs. Abdul Rahman Al-Ahmadi. Detik2 Sejarah Kelantan. Pustaka Aman Press, Kota Bharu, Kelantan, 1971. Ibrahim Syukri. History of the Malay Kingdom of Patani. Center for International Studies, Ohio University, Athens, Ohio, 1985.
Who's Who in Malaysia and guide to Singapore. J. Victor Morais, Kuala Lumpur, 1967-1978.